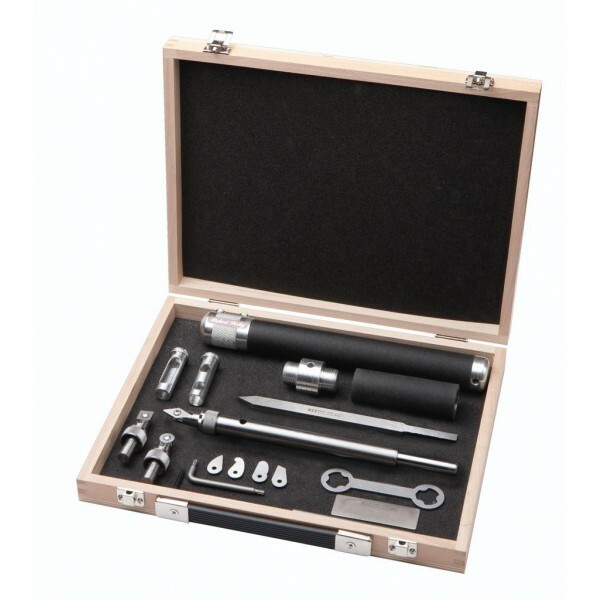 SKU: SOV-RSTMDBS Categories: Hand Tools, Robert Sorby, Woodworking Tag: 20th March 2019 just sold out new stock awaited. Robert Sorby SOV-RSTMDBS Sovereign Turnmaster Set. No only is it an introductory tool for the beginner. It is also a fantastic foil for the more experienced woodturner looking for another flexible tool to equip their workshop. This set delivers economy and efficiency in abundance. Three easily attached heads allow for quick interchanging of tools at a fraction of the cost of three separate versions. These can be prepared in advance of a project. This therefore allows the turner to quickly swap heads and deliver varying cuts in a matter of seconds. The patented detachable heads have been the single biggest selling accessory for a system that has taken the turning world by storm. The indexing action delivers three standard cuts and therefore demonstrates the highly practical nature of a system. The set also offers three metallurgies (high speed steel (HSS), titanium nitride and tungsten carbide) and seven cutting tips. ” TurnMaster shank with HSS detailed point cutter fitted (RSTM HCT2). ” Round Cutter (RSTM Tip1) (fitted to head) – a general purpose cutter, excellent for rapid removal of material. ” Detail Point Cutter (RSTM Tip2) (fitted to head and shank) – Excellent for roughing square to round when turning centres on spindle work. ” Square Cutter (RSTM Tip3) (fitted to head) – used for generating square shoulders on tenons where a turned. part is to be assembled into a hole e.g. a chair leg. Also a great shear scraper. ” French Curve Cutter (RSTM Tip4) – great for finishing out in egg cups, goblets and round bottomed boxes. ” Teardrop Cutter (RSTM Tip5) – ideal for scarping and shear scraping inside forms. ” Mushroom Cutter (RSTM Tip6) – designed for undercutting mushrooms but has many applications.